Video: Q13 Fox Seattle coverage of the 2017 CSNE Hackathon. UW’s CSNE (Center for Sensorimotor Neural Engineering) hosted its 2017 Hackathon February 10-13. 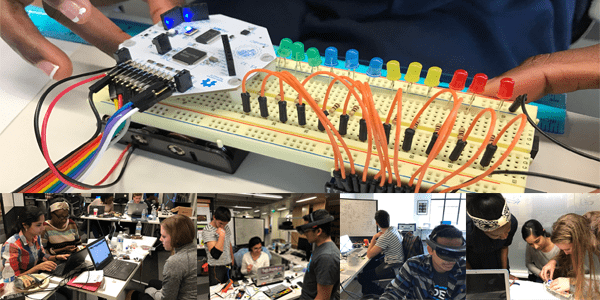 The competition brought together fifteen students from the UW, MIT, San Diego State University, Spelman College, Arizona State University and Southwestern College to create technologies to address sensorimotor neural engineering challenges. The competition aligned with the CSNE’s core missions of uniting the human brain with technology, improving the quality of life for people suffering from sensorimotor neural disabilities, and engaging the next generation of scientists and engineers. The Hackathon started in 2014, and was spun out from a UW course called “Technology Sandbox” where student teams devised solutions to neural engineering problems. CSNE students were inspired by the success of the course, and launched the Hackathon to encourage collaboration between more students at the UW and at other universities. Participants had 36 hours over two days to design, build and test their devices. All teams had access to a box of common supplies, including open source software packets, wires, resistors, Arduinos and more. Teams also selected one or two advanced devices, including the Myo Armband, select OpenBCI products (Ultracortex “Mark IV” EEG Headset, Cyton boards and Ganglion boards), Microsoft HoloLens and Sensoria Developer Kit. OpenBCI sponsored this year’s event, and AJ Keller from Open BCI/Push the World volunteered to help students with OpenBCI products. On the last day, the teams presented their projects to a panel of faculty and industry judges. The judges included Eric Chudler (Executive Director, CSNE; research associate professor, UW BioE), Ryan Buckmaster (Senior Technology Manager, CoMotion), Laura Specker Sullivan (postdoctoral fellow and leader of neuroethics thrust, CSNE), Miah Wander (Microsoft Research; Ph.D. alumnus, UW BioE), Andrew Sloss (Senior Principal Engineer, ARM) and Maggi Molina (Bunker Labs). The winning team was DropStop, an interactive system for patients with foot drop. The team included UW BioE/Computer Science double major Camille Birch, past CSNE-REU student Alisha Menon (currently a electrical engineering student at Arizona State Univerity) and MIT mechanical engineering student Rachel Adenekan. Physical therapy is recommended for foot drop patients, but the tasks assigned can be difficult for patients and their frustration can lead to noncompliance with treatment. DropStop aims to motivate patients and improve treatment outcomes by providing audiovisual feedback as a patient completes physical therapy tasks. The system measured anterior tibialis muscle activity via surface electromyogram sensors connected to an OpenBCI Cyton biosensing board. The Cyton recorded and communicated wirelessly with the computer connected to an Arduino Uno through a USB dongle based on the RFduino radio module driving audio and visual feedback. EEGuide: An open reproducible neurofeedback platform based on Ultracortex, Cyton and Python Flask. Personal Baseball Pitch Trainer: A Myo armband, 5DT Dataglove and Python solution to offer personalized baseball pitch training. StressLess: An OpenBCI and Unity-based stress feedback and management environment. Extend Your Limits: A HoloLens, Arduino and BakyeardBrains Spikershield augmented reality rehabilitation platform. Learn more about the UW CSNE.